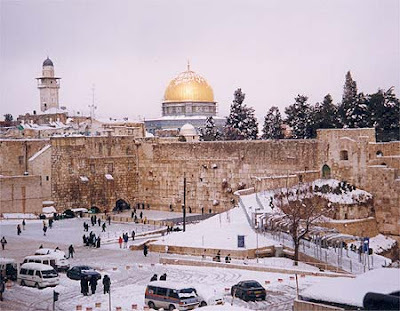 ... you have to admire His sense of humour in blanketing Jerusalem in snow on the very day that Winograd was to whitewash Olmert's failings in the Lebanon War. If you've ever wanted to vent about the United Nations and its blatant bias against Israel whilst turning a blind eye to abuses throughout the world, you're in for a treat. Here's the new executive director of UN Watch, Hillel Neuer, castigating the UN Commission of Human Rights in Geneva. Background voices try to stop him halfway through and, when he is finished, the chairman effectively bans any further statements of this kind. Bravo Mr Neuer! Lets's hear lots more from you! How cheering to read this morning that the government's security guards are threatening to go on strike. Apart from their poor pay and conditions, it must be truly demoralising to protect corrupt ministers. Leaders who close down security checkpoints, free recidivist murderers and send them guns and ammunition for the next assault. By doing so, these guards are protecting the very people who are endangering their own families at home. I hope the strike goes ahead and lasts a long time. 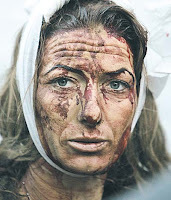 Let's see how Olmert, Livni and Ramon feel without protection. Perhaps after a day or two they will appreciate the plight of citizens like this in Sderot, whom they have left unprotected so callously for so long. They used to say that the Arabs "never missed an opportunity to miss an opportunity". In that process Israel usually benefited from Arab mistakes. All that has changed now as the Kadima Crazies seek to outdo even the lunacy of Rabin's Oslo surrenders in feeding, healing, heating, lighting, arming and rescuing the enemy that has never ceased inciting and espousing the total destruction of Israel. 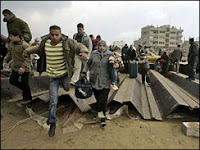 With the trampling of the Rafiah border fence, over half a million Gazans have spilled over into Egypt; one of the 5 Arab countries that created their refugee status by invading the nascent State of Israel in 1948. For 60 years they have refused to invite their Arab brothers to make a home and a future for their families in Egypt. Now 500,000 family members have turned up uninvited. In normal times one would expect Israel not the miuss this opportunity to truly disengage from Gaza, seal the border and leave the the Egyptians to take care of the Gazans for whose plight they have shed som many 'crocodile tears'. But just like King Saul failed to kill Agag when he had the chance, and just like Israel allowed Arafat safe passage out of Beirut and then brought him back from Tunis to Ramallah on the Oslo lifeboat - you can bet that Olmert and Livni will overreach themselves in missing this opportunity. Once again - without being asked - Olmert will be the first to volunteer to help its 'peace partner' Egypt to restore the status quo. Will Arabs vote Jews out of Jerusalem? The 'beginning of the end' of the Olmert government is how some Likudniks described Avigdor Lieberman's resignation from the coalition yesterday. It was always expected the the Sefardi-Haredi Shas party would quickly follow (with a record of so many walkouts from prevous coalitions, they did not want to be first to bolt this time). Shas are now saying that they will stay with Olmert for as long as he does not sign over any part of Jerusalem to Mr Abbas. This would seem to mean that Yehuda and Shomron are dispensable. Are Rabbi Ovadiah Yosef and his Haredi lieutenants in the Knesset content to see 250,000 mainly religious Zionists uprooted from their homes in the so-called West Bank? Are they so naiive as to think that a practised crook like Olmert is not capable of deceiving them as well? And that, as soon as Olmert has signed away whatever Shas will let him surrender to Mr Abbas (and ultimately Hamas) he will eject Shas and replace them with the self-hating Jews of Meretz and the gleeful MK's of the Arab parties who wil gleefully support the surrender of the Jewish capital. 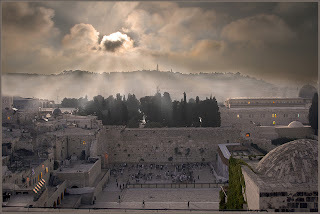 Will Shas knowingly provide the casting vote on Jerusalem to a handful of Arab MK's? 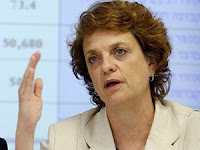 After the longest school and university strikes in Israel's history, I hear Prime Minister Olmert has decided to remove Yuli Tamir as Minister for Education and appoint her Minister of War. 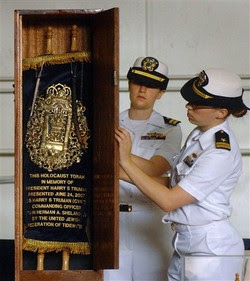 In case you were wondering about that minyan on the USS Harry S Truman, be assured it also has its own Sefer Torah. Here it is after being presented to Captain Herman Shelansky on the Nimitz-class aircraft carrier he commands, on June 24 last year in Norfolk, Va. It's one of the few Torah scrolls from Lithuania to survive the Holocaust, in which many of Shelanski's family members perished. Adolf Ahmadinejad needs to rein-in his speedboaters in the Persian Gulf. 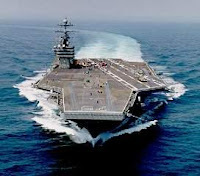 Last week’s mock attack on the US carrier force came close enough. But if A-jad pushes his luck any further, he will find himself up against a Jew with the biggest guns in the East. That Jew is Captain Herman Shelanski, commanding officer of the lead strike force carrier Harry S Truman. 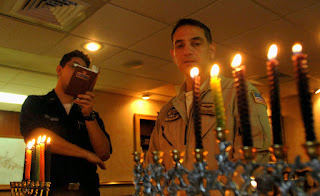 He is the first carrier captain to have a minyan on Friday nights and is seen here lighting Chanukah candles on board last month, as his adjutant sings Maoz Tzur from an ArtScroll siddur. So Adolf … mind your damn manners in the Gulf! Herman’s waiting for you with 100,000 tons of cold steel displacement, 3000 crew and over 85 strike aircraft on 4 acres of flight deck. 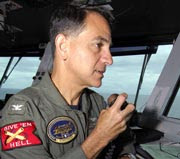 He’s got Aegis-guided missiles and guns that fire more than 3,000 rounds a minute. And those rounds are just the ticket for you. They’re tipped with the same uranium that you so love to enrich. Because Hell is what awaits you Adolf – just like all those on the long list of dead despots that swore to wipe out the Jewish people. God bless America and all that sail with her ! This man holds up a message for President Bush as his motorcade wends through the future home of Hamas in the West Bank. Indeed, it IS the occupation that is the problem. It's the occupation of this man's mind and the minds of all his people with Wahhabist indoctrination of hate and holy war against all of us infidels. That's an occupation of minds that starts from kindergarten, graduating to a cleric's medrassa and ends up in a training camp somewhere in the hills of Afghanistan or Iran. And it's all for one simple purpose. As long as this man and his people are inhaling this 'opiate of the masses', they'll not be asking the critical questions that the sheikhs, mullahs and clerics would rather not answer. Like where has all their oil money gone? Why should millions of Arabs pumping oil at $100 a barrel still be going hungry without proper sanitation, sufficient food, decent homes, basic healthcare and education in subjects other than the jihad? And why the only truly free country in the Middle East where Arab men have a vote and their women can drive their kids to school in a car should be Israel. That's why the poster tells it right. It's the occupation of their own minds that makes them stupid! Just how the Wahhabists want it. If you've ever wondered what Jews were doing in the West Bank and thought that building homes there was illegal, read this article by Shmuel Katz. At the age of 93 this former biographer of Ze'ev Jabotinsky is still a credit to his mentor and sends a message of hope and encouragement to the brave returnees of Zion. 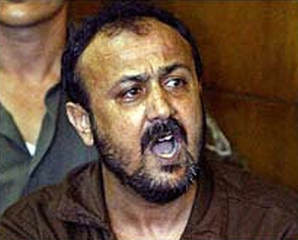 Suddenly everyone's in a hurry to release Marwan Barghouti. If truth be told, he is a prisoner in name only. How many murderers serving five life terms can run a presidential campaign from their cell? Or conduct interviews with the press whenever they like? Or be given every possible privilege from cellphones to regular furloughs outside prison? So why the hurry to let him go? In exchange for the release of Schalit? Could it be that Bush and Olmert have realised the weakness and frailty of Mahmoud Abbas and the total impossibility of his being able to resist Hamas or stop their takeover of West Bank strongholds the moment they are ceded to Fatah by Olmert? And so - barring an earthquake in the Knesset, for there is little doubt Netanyahu would also be persuaded to free Barghouti to please Bush - we have the prospect of Barghouti leaving jail as a five-times lifer, walking into the nearest phone box and emerging as leader of the new Palestinian state and our trusted peace partner! Peres was right all along. The process is all about piss! We are being pissed on and Olmert says it's just a spot of rain. Jerusalem came to a complete standstill today for the arrival of US President George W Bush. The main Route 1 into and out of the city was closed for a period of time as were some of the busiest downtown sections which remain severely restricted. Tens of millions have been lost in cancelled business appointments and the frustration to commuters must be enormous. 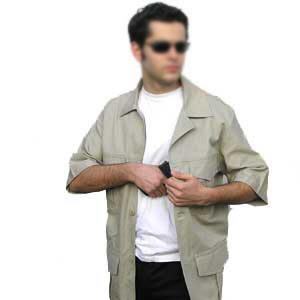 Apart from this, the cost in security protection must also run into several millions of dollars. To protect the President from Arab terrorists. And the reason for his visit? To get Israel to free hundreds of Palestinian terrorists (no different to those who would readily blow themselves up in his presence). To get Israel to close down hundreds of security checkpoints (no different to those set up to protect his own security during the visit). To get Israel to give Mahmoud Abbas and his Fatah army control of West Bank territories which overlook Ben Gurion airport and from which, with a decent pair of binoculars, any terrorist could have counted the freckles on Bush’s worried brow as he stepped off Air Force One. (That’s the same West Bank which - even under Israeli military control - still had to be put under total curfew for the Bush visit). And when it’s all over and Bush flies off into the Mediterranean sunset, he will expect Israelis to live side-by-side with the very same Arabs as all these roadblocks, closures and millions of dollars worth of security were needed to protect him from. The day Bush can walk as freely through Jerusalem as he does in Washington DC, is the only day that Israelis can afford to lower their guard and grant concessions of ANY kind. Do not unto others, etc…. 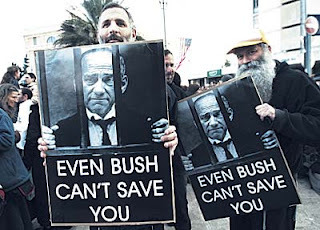 On the eve of Bush's visit to Israel, there was brief hope that we could finally be rid of Olmert and see the back of the most incompetent and corrupt government in Israel's brief history. The leaders of coalition props Shas and Yisrael Beiteinu said they would walk out of the coalition if Olmert discussed dividing Jerusalem or the core issues of 1967 borders and returning refugees. It took less than 24 hours for them to backtrack. Isn't that the exact time he ought to be making waves? Like showing Bush and the world's press that there are people (and parties) in Israel that do NOT trust Mahmoud Abbas, that do NOT agree to the West Bank being turned into Gaza II and that do NOT agree that Olmert has the mandate to agree anything on their behalf? As for Shas, their backtrack was truly absurd. They say that if Jonathan Pollard is freed after 22 years in a US prison, they will agree to Olmert discussing Jerusalem's status with Mahmoud Abbas. Does Shas spiritual leader Ovadia Yosef think Pollard took all those risks and gave up 22 years of freedom to become a means of dismantling the Jewish homeland??? Pollard's continuing imprisonment is the greatest affront to human rights and civil liberties that currently exists in the world today. It makes Mugabe's Zimbabwe look like a paragon of liberty! The median stretch for his type of conviction was 5 years. After 22 years he is still in prison for one reason only: for being a Jew! To suggest that Pollard's release should become a bargaining chip for the surrender of Jerusalem is tantamount to Nelson Mandela being offered freedom from Robben Island in exchange for the return of white slavers to Africa.